Line a 9-inch baking pan with foil. Spray the foil with no stick cooking spray. If you are using a mold, you can line it with Saran Wrap or simply spray it well with no stick cooking spray. Measure out the two pounds of chocolate in a separate bowl. Set aside. 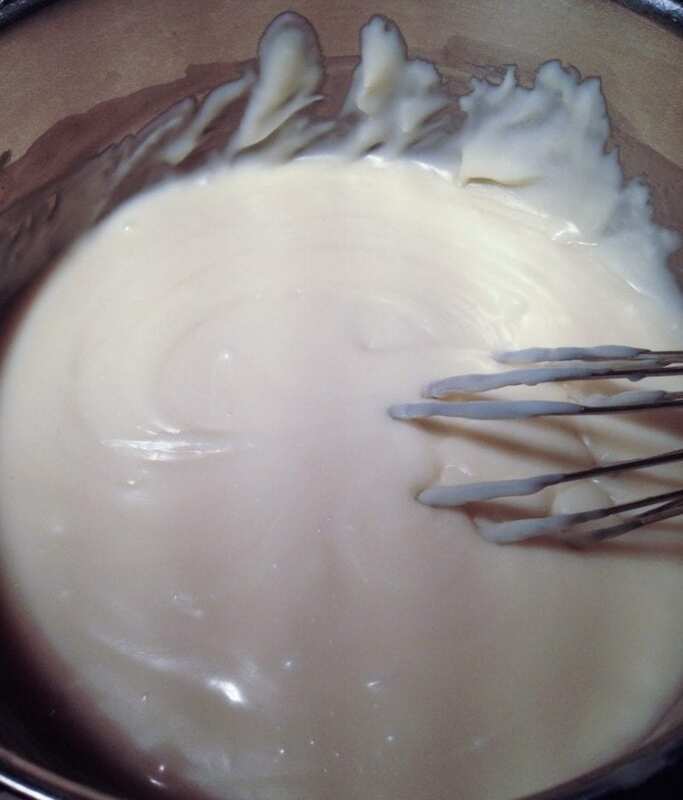 Pour the sweetened condensed cream and the heavy whipping cream into a medium saucepan. Whisk to combine. Set the saucepan on medium heat and continue to whisk occasionally until the mixture begins to simmer. Pour the chopped chocolate into the pan and allow it to sit for one minute. This helps the chocolate melt. Whisk the melted chocolate mixture until it is smooth. 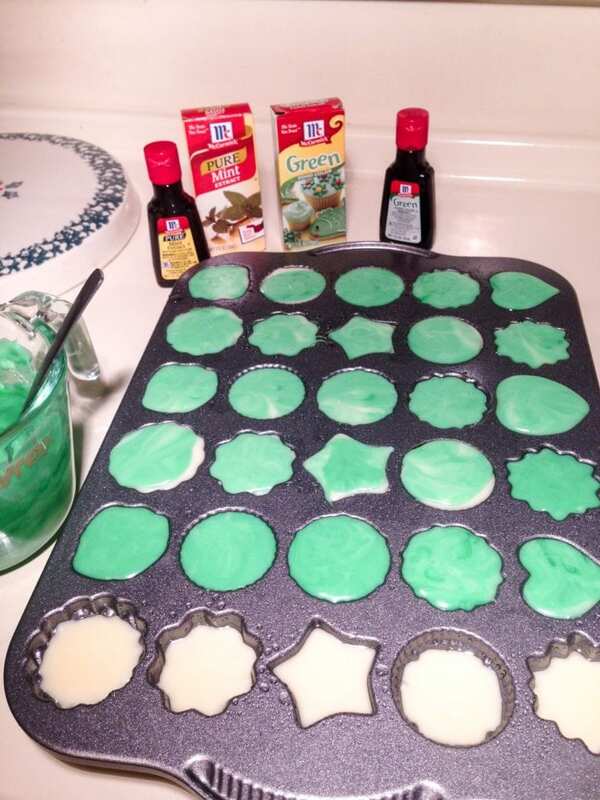 Stir in the McCormick® Pure Peppermint Extract. Remove 3/4 cup of the chocolate mixture. 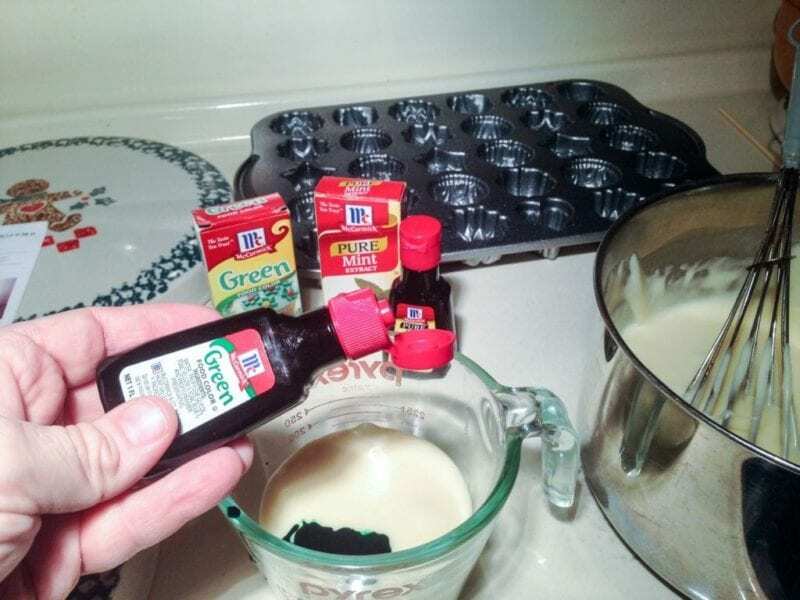 Tint the chocolate mixture you removed with 3 to 4 drops of the McCormick® Green Food Color. Pour the remaining chocolate mixture into the prepared pan. If you are using a mold, spoon the mixture into the mold filling it about 3/4 full. When the white chocolate is completely in the pan or the molds are filled, spoon the green chocolate over the top – and yes, you may need to make more green chocolate to complete the project. I did. 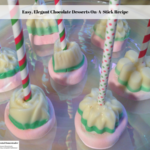 Use a skewer or knife to mix the two chocolate colors which creates a marbled effect. This is a little harder to do if you are using fancy molds. Refrigerate the chocolate for at least 4 hours – but overnight is ok.
Bring the chocolate to room temperature before cutting or attempting to remove it from the mold. At this point you can refrigerate the chocolate for up to 2 weeks before you assemble it or assemble it right away. 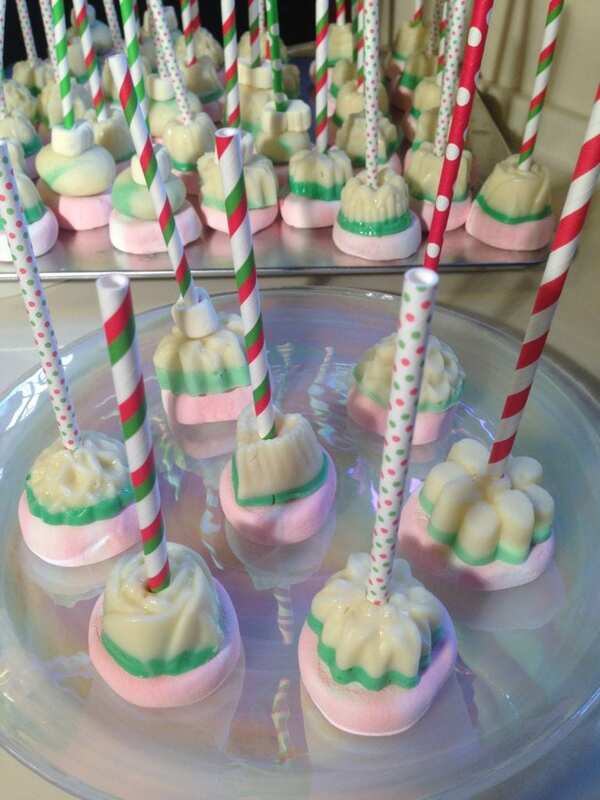 Once the chocolate is cut or unmolded and you are ready to assemble the peppermint white chocolate on-a-stick, get the kids involved and let them put the chocolate and marshmallows together. To do this this, you can either cut the marshmallows in half or use them whole. I left mine whole because I like a lot of marshmallow in my hot chocolate. The proper assembly depends on whether you molded your chocolate or just cut it into squares. If you cut your chocolate into squares, put the chocolate on the bottom, the marshmallow on top and run a lollipop stick through the center. If you molded your chocolate, like I did, put the marshmallow on the bottom and the chocolate on top. I did have a few pieces that did not come out of the mold perfectly. Some were repairable and others were not. I repaired the ones I could using soft chocolate and the other ones I rolled in my hands into balls. These are ok to go ahead and use, they just don’t look as pretty as the molded ones. 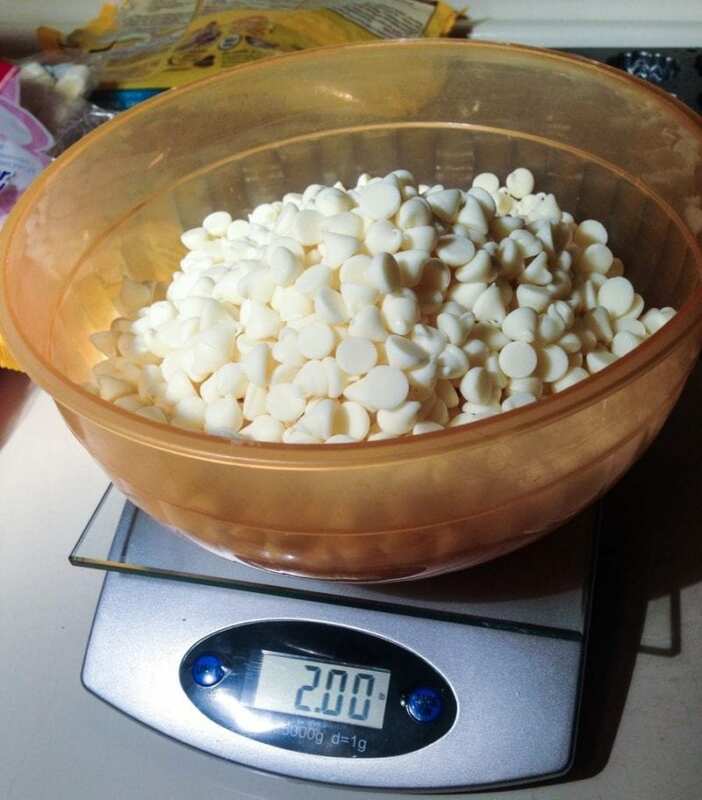 Once the peppermint white chocolate and marshmallows are assembled, wrap each one in a small cellophane bag and refrigerate. Make sure to use them up within 2 days. To serve, eat them as they are or heat 8 ounces of milk, pour it into a cup and put the peppermint white chocolate on-a-stick in the cup. 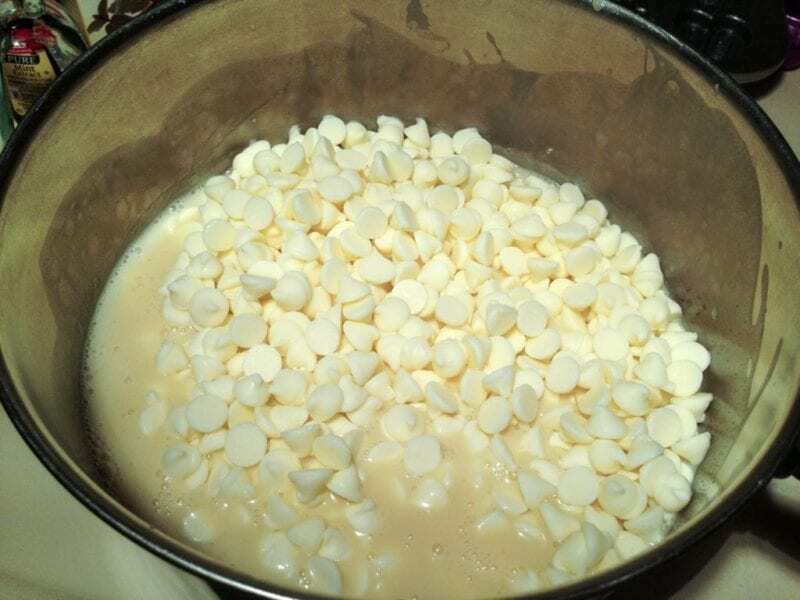 Stir it around until the chocolate and marshmallow melt.